I had a couple friends over and we wrapped duct tape around each other until we nearly died from the heat, but Noel was more responsible. First he got the second piece of drywall up. You may notice that the pieces are a bit more tricky than just rectangles. 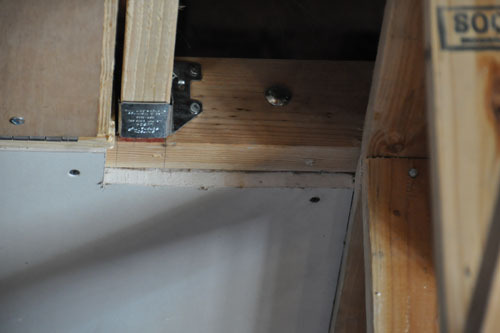 Because drywall needs to be screwed into something, he notched the first pieces to allow the sides to leave room for everybody to have some board to connect with. Making these notches using the Fein tool is much easier than trying to cut them out with the utility knife by hand the way we used to do it. Then the first side was in place. 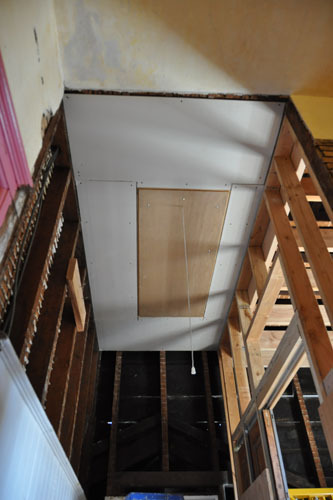 The back of the piece of drywall had to be cut down a little to accommodate the joist hangers, but that was easy enough. 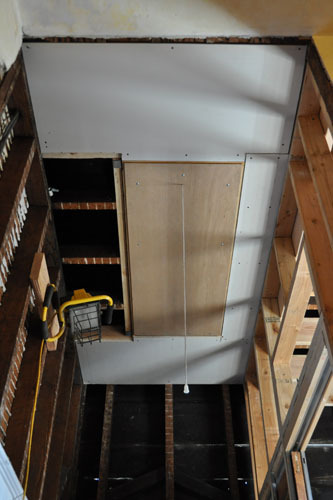 And the finished ceiling. When the sun was going down tonight it was amazing how much sunlight was reflecting off that ceiling. The bathroom (and maybe a bit of the hallway) is going to be VERY bright. I am so glad that you are feeling better. 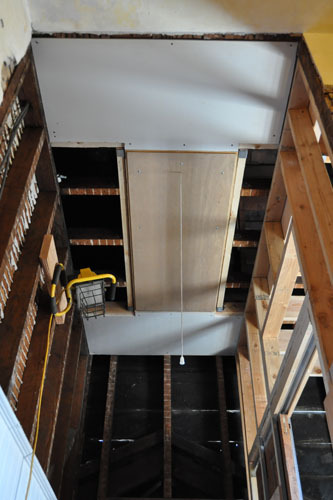 The ceiling looks great and I love an attic ladder, I hung an old high tank toilet pull on ours. Duct tape. Are you making dress forms? Yes, we made dress forms. Doing it on the hottest day of the year was not totally bright, but it worked OK.
Good job on the ceiling!I was about to ask about duct tape too, but the question was already answered... Nice one!